Brahma beholds the divine Abode of the Lord and is taught by Him the text of the Bhagavata, consisting of four couplets only. How to attain Liberation through the differentiation of Matter and Spirit? 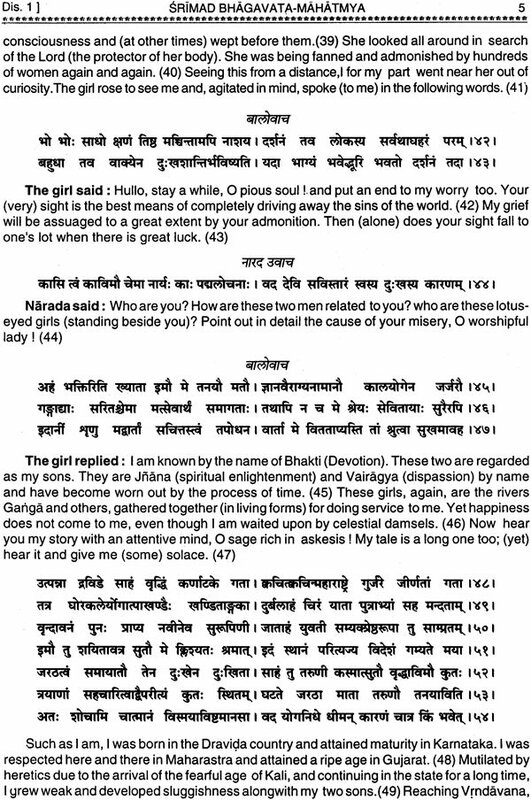 Bhagavan Visnu confers a boon on the Pracetas, who then return to their city and marry the foster-daughter of the trees. 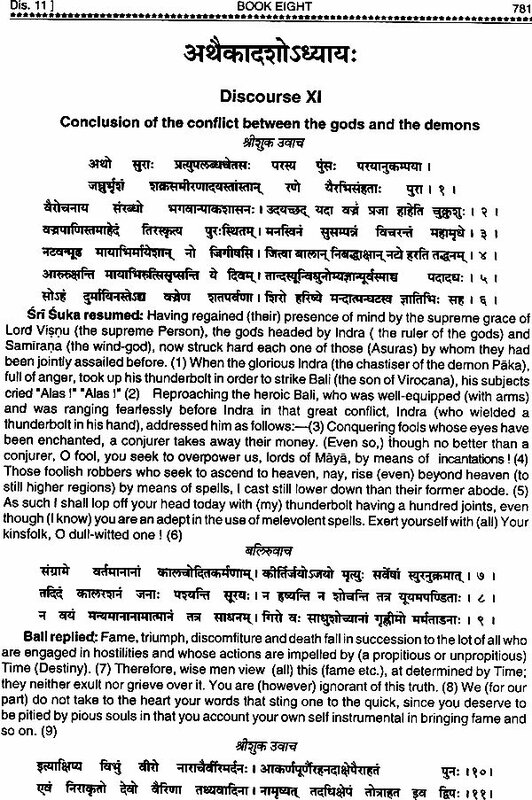 Bharata allegorically represents this state of worldly existence as a forest and the doubts of Rahugana get resolved. The leader of the elephants extols the Lord and is rescued from the dangerous situation. The gods and demons proceed to churn the ocean and Lord Siva drinks the poison appearing out of it. The manifestation (in a personal form) of the Lord's (own) enchanting potency. The Lord appears as the divine Dwarf and visits the sacrificial performance of Bali. The Lord asks three paces of land of Bali, who gives his word; while Sukra remonstrates with him against this course. The story of the descent of the divine Fish recounted. 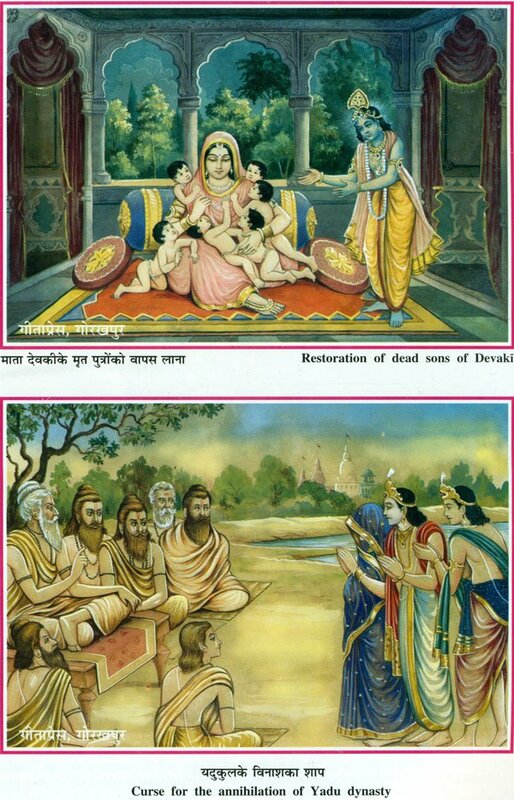 The story of the sage Cyavana and his wife Sukanya; the posterity of King Saryati. Nanda's conversation with the cowherds about Sri Krsna's glory. 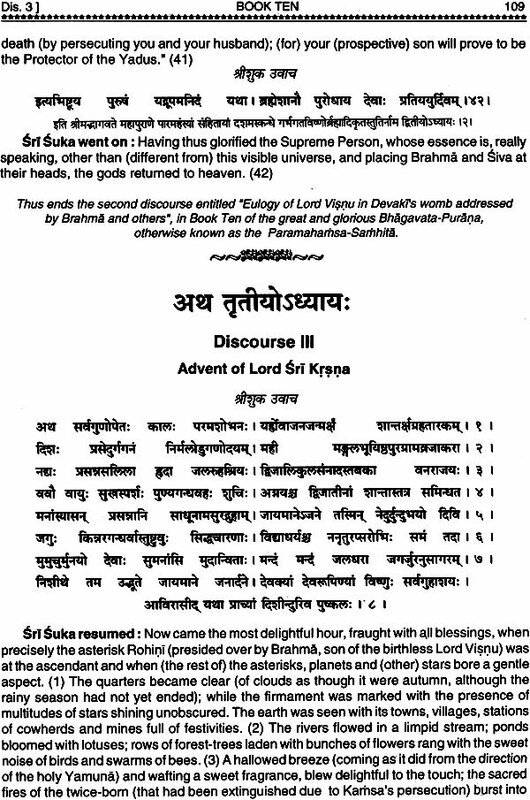 The Lord pays a visit to Kubja (the hunchbacked woman) and Akrura at their respective places. 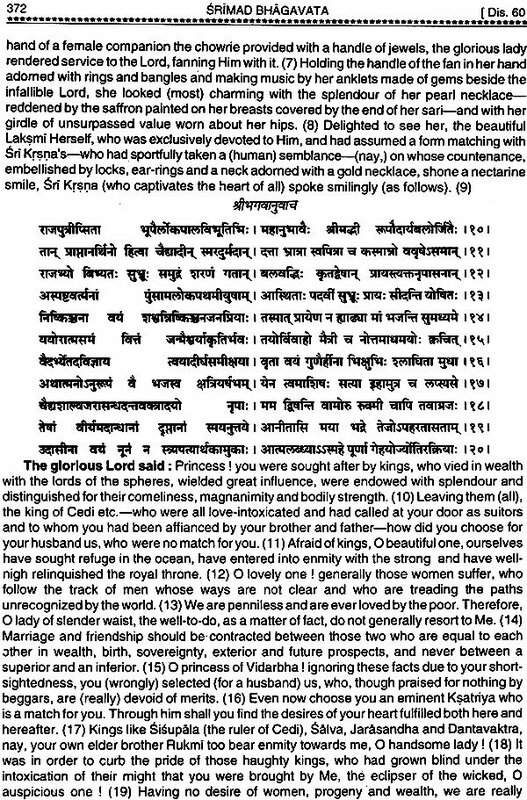 Discomfiture of Sisupala's allies and Rukmi and the Espousal of Rukmini by Sri Krsna solemnized. 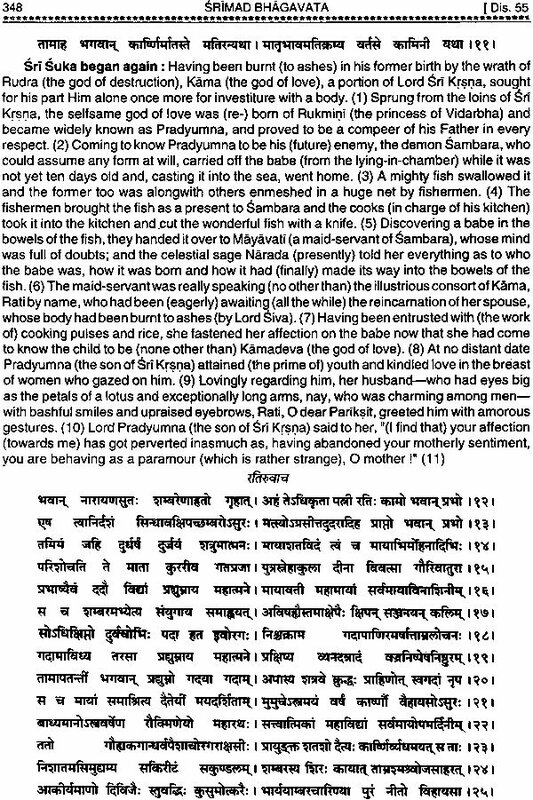 (A description of the Lord's progeny;) Rukmi killed (by Balarama) during Aniruddha's wedding. 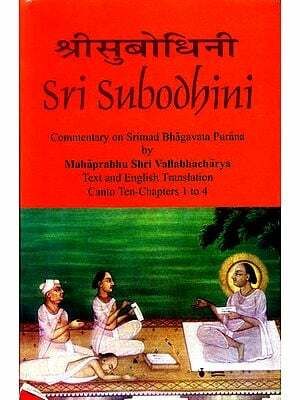 The Story of (the amorous sports of) Sri Krsna narrated. 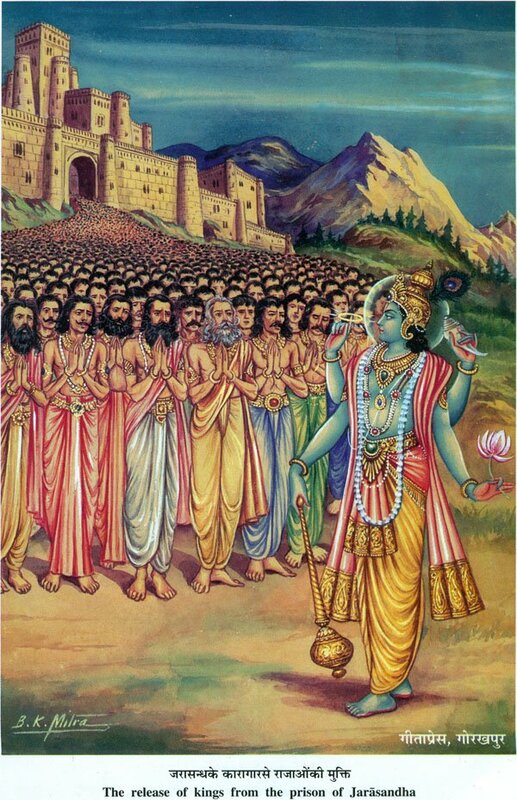 Narada visits Vasudeva and reproduces the dialogue between king Janaka and the nine Yogiswaras. The Legend of and Ascetic - the Story of eight (out of twenty-four) preceptors (from the earth to the pigeon) recognized by him. The Glory of Satsanga; how to perform one's prescribed duty and how to relinguish it? A Dissertation on Devotion, Spiritual Enlightenment and Yogic disciplines in the form of the five Yamas, the (five) Niyamas and so on. 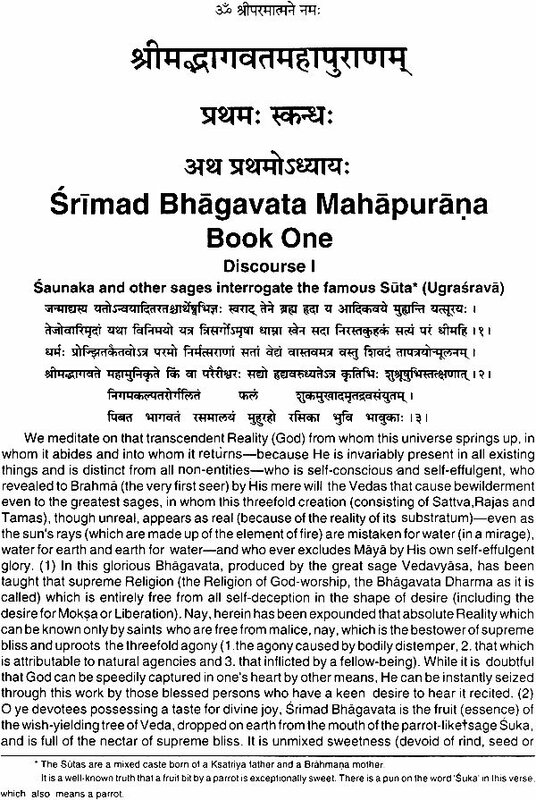 Jnanayoga, Karmayoga and Bhaktiyoga analysed. The process of determining what is good and what is evil and the secret underlying it. 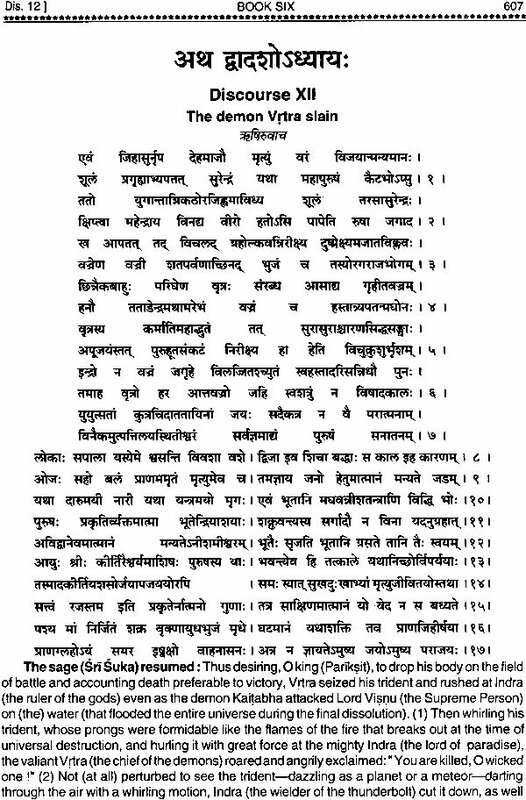 The extent of the eighteen Puranas and the glory of the Bhagavata.